The Meshugene Quartet appeared on Show 248. 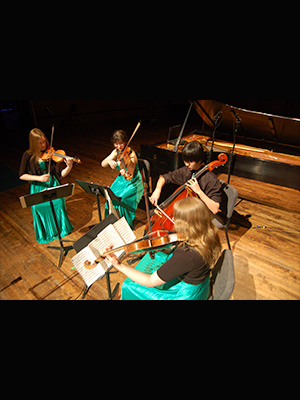 The Meshugene Quartet is coached by Allan Dennis, founder of Midwest Young Artists. The Illinois-based quartet is comprised of 15-year-old violinist Rachel Stenzel from Holiday Hills, 18-year-old violinist Lisa Chertok from Vernon Hills, 18-year-old violist Ariel Chapman from Lincolnshire, and 15-year-old cellist Christopher Gao from Long Grove. The quartet recently placed first in the Rembrandt Chamber Players High School Chamber Music Competition. 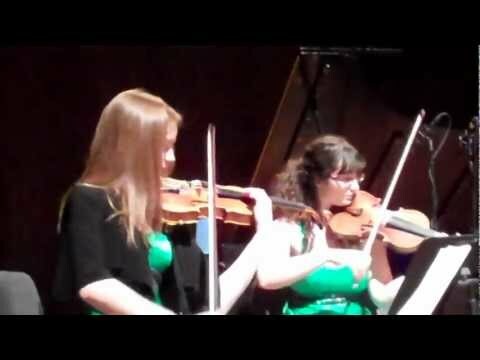 Last year, they won the Midwest Young Artists division of the Midwest Young Artists Discover National Chamber Music Competition. They performed on From the Top’s broadcast taping in Ogden, Utah this March.